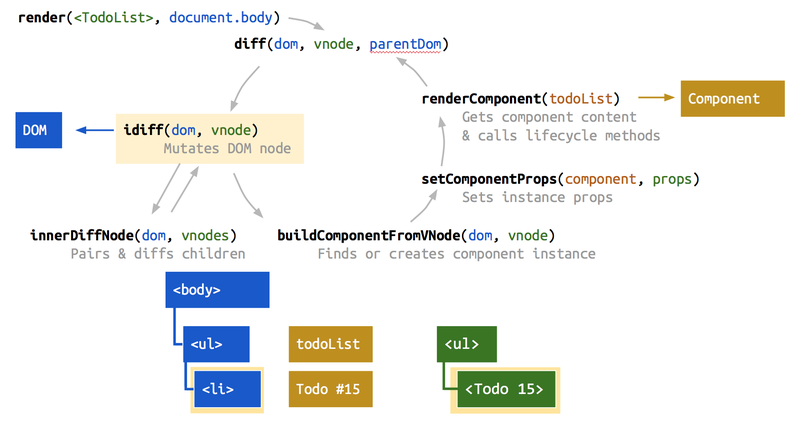 Part 2 walks through what Preact is doing internally to render and diff a simple application. To many people, the virtual dom and component model seem like black magic that mere mortals shouldn’t try to understand. As I hopefully demonstrated, this isn’t true. It’s a reasonably simple algorithm with a few fiddly little details. While React is implemented somewhat differently, knowing Preact’s internals is still a good first mental model for approaching it. The video doesn’t pick up details on the slides, so you may want to view them directly. If all you want is to see the Preact algorithm diagram, a high-res version of the final state is below the video.